Pork is king in my household. As I've discussed before the males in my house are huge pork fans. Especially bacon, lots and lots of bacon. Growing-up I was a little different. I was a vegetarian beginning freshman year of high-school. Luckily my parents were very supportive and I lived in the Pacific NW so there were numerous places to purchase great vegetarian food. I stayed a vegetarian until I moved to West Virginia. Between graduate school and anemia I decided that adding meat back in would be a good idea. Then I met my husband who thought vegetables were a garnish for meat. Over the years I have slowly reformed him into eating meat as an ingredient and we eat one to two vegetarian dinners a week. This week we tried a new recipe for Asparagus Pesto from the April 2013 issue of Food and Wine magazine. This recipe has 8 ingredients. It takes 20 minutes, all of which is active and makes enough for a pound of pasta. I did make a few changes. Since I eat gluten free I substituted gluten free ziti for spaghetti. I found that the pesto need a significant amount of salt for the flavor not to be bland, don't be afraid to add salt. The basil flavor in this recipe comes through more than the asparagus. This recipe would be great for someone that wasn't a fan of asparagus, but still wanted the health benefits. Crumbled bacon would be a great addition to this dish as a topping. Overall, a great way to add spring flavor and even my youngest son loved it. For the recipe go to Asparagus Pesto. What a pretty pasta! I love the addition of asparagus. I almost picked some up the other day, but didn't (regretfully). Looks like I'll be going to the store to get some. I love asparagus, it's one of my favorite spring vegetables! I laughed when you talked about bacon. My husband could eat bacon at every meal. The pasta looks delicious! The males in my family could too :) Thanks for the sweet comment! This looks great. 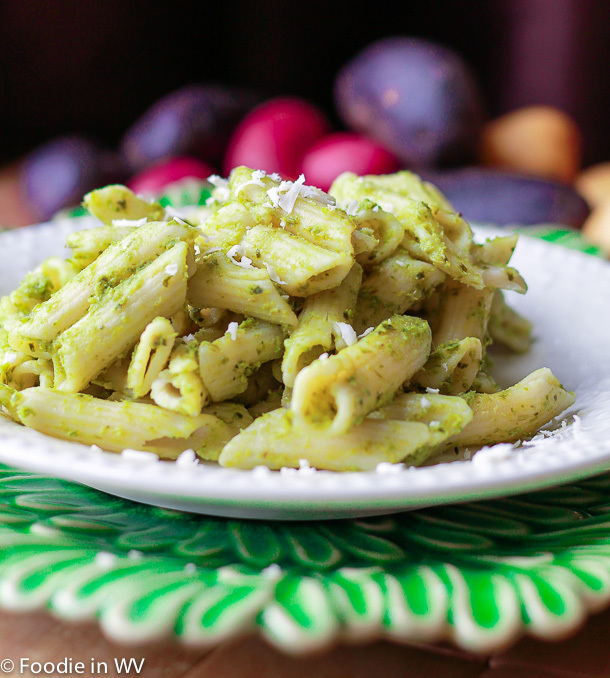 I love pesto and I'm always looking for new ways to make it. I love pesto too, yum! It is so simple and yummy! I like that the basil is stronger than the asparagus. Looks so yummy! I love the taste of basil it is delicious! Not a vegetarian but this one looks easy enough to cook. And it looks good too. This looks yummy. Have you ever used canned asparagus? I'm going to try this. Just wondering if it would work with canned asparagus. It looks delicious. Thanks for sharing up at Family Fun Friday.